I don’t know why this post has been so hard for me to write. I have sat down many times…and nothing. This “race” was different for me. I set goals. I had a plan. And then, life got in the way. I went back to work. I lost my primetime training time. My bike broke. With all the challenges, I lost my confidence. I went into this race day, scared, nervous, and completely unsure. I had no idea what to expect. I feared the water. We received an e-mail the night before letting us know the swim portion may be cancelled all together due to questionable water test results. I later feared death as I inadvertently swallowed some of the lake water. A bundle of nerves, I arrived much earlier than anticipated. I couldn’t sleep so I figured I would head on over. Luckily, I ended up parking right next to one of my partners in tri crime. We ventured over to the transition area. We had no idea what we were doing and followed the lead of others who looked to know what they were doing. We laid out our gear, hung up our bikes, and chatted. As time passed, we prepared for the swim. Only to hear that the start would be delayed ten minutes. Okay. Time to use the restroom. And then another twenty-minute delay. And then another. And then another. ONE HOUR later, the first wave was finally preparing to hit the swim. Road work forced the race staff to re-route the bike route which caused an overall hour delay in the entire race. As we finally set foot in the water, I was confronted with seaweed. It’s a texture thing. It’s slimy. And gross. And I just don’t like it. At all. I realize it won’t eat me. Or kill me. But it will touch me. And it did. I wasn’t prepared for the swim. For the mass start. For the head kicks and body shoves. For the massive amounts of water I would swallow just trying to find a space to fully stroke forward. I simply did all I could to finish. It wasn’t pretty. It wasn’t fast. But I finished. And learned that you should swim as far in as possible. I stood up too soon. And quickly realized just how hard it is to run in water. I was physically exhausted. And we had just started…I am so not a swimmer. Off to the transition area. Running in tri swim gear: not so fun. Humbling. Jiggly. And off I biked. Despite the plethora of women that passed me, I was working HARD. I cursed the fancy road bikes passing me. And pedaled away. Finding a groove. Hoping I could recover some time on the run…I am so not a biker. Finally back in the transition area, I hung up the bike. Grabbed my hat, threw on a skirt to cover the caboose, and ran off. In my head, this was all done gracefully and quickly. In reality, not so much. My legs were utter and complete jelly. I willed myself to run faster but it didn’t happen. I just tried to keep moving…and managed to do so. It took nearly two miles for my legs to find a groove. It was a three-mile run. I have never been so happy to see a finish line. All in all, I am excited to have finished. I can say that I have completed a triathlon. I can also say that I have absolutely no desire to do another. * Lake swims = nasty. No, thank you. * I literally worried for days afterward that the kick to the head that forced me to swallow water might cost me a limb, or stomach virus. No third eye, yet. * Tri gear is not photo friendly, the damn bike shorts cut right into your thighs for a remarkable and impressive sausage look (even more special when wet and sparkly). * Training for three disciplines is a million times harder than training for one: finding a pool, finding a pool with kid care, finding a gym for spin or sitter for kids to bike, finding time to run…yada, yada, yada. 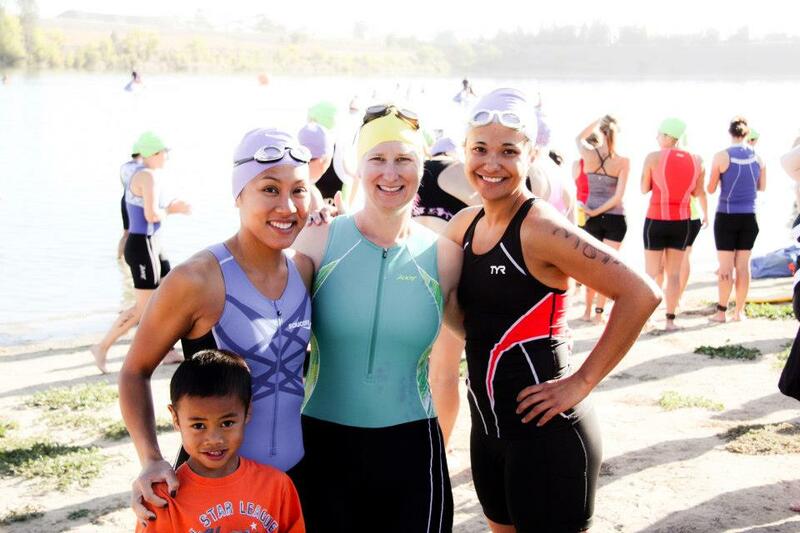 * Tri race photos take bad race photos to a whole new level, whoooooooole new level. * The dog paddle is remarkably effective and keeps your face far away from said nasty lake water. * I have driven, remarkable, athletic women in my life who also completed this race with me. I completed the swim. I finished the bike portion. I survived the run. Congratulations! (and if you do ever go for another one, gear down at the end of the bike so your legs are going really fast, or same rhythm as they would be running, that stops some of the jelly leg feeling) But well done for finishing! This is really bad, I don’t even know what that means!! This was literally the first time I’ve really ever ventured into biking. What does it mean to gear down?? Um… maybe I’ve used the wrong words. Choose a lighter gear? I.e. change the gears so that the pedals spin faster for the same travel speed. Does that make sense? Apparently the problem is your legs are used to going slower on the bike and so you jump off and try to run and they take a while to speed up again. It does seem to help anyway. 🙂 So does finding a triathlon that doesn’t involve weed!